How many time have you wondered: "how come my brand new 300 Gb hard drive is full already, where did all this space go ?". With traditional tool (Explorer, Finder) it is tedious to know what is eating space the most. iFindSpace enables you to very quickly find where is the space on your hard drive ! Just point to a folder and you will be shown a graphical view of the space used with number of files, space taken in bytes, percentage of the total and even with an easy to read embedded bar chart. 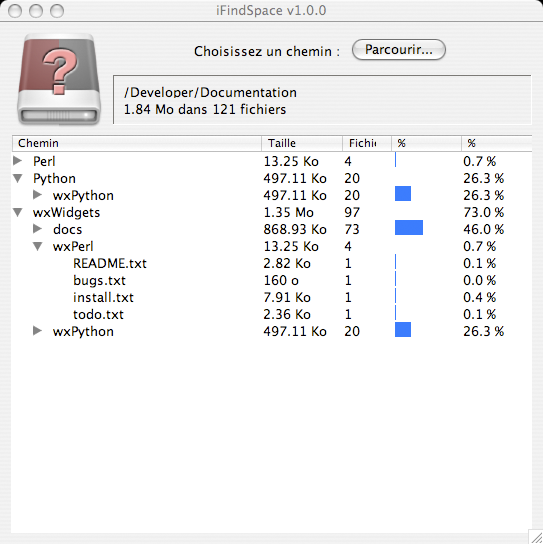 iFindSpace is available as ready-to-use setup for MsWindows and MacOSX, and runs in either French or English language depending on your computer setup. 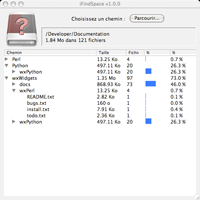 iFindSpace is an open source C++ program based on the wonderfull QT 4.0 toolkit. The full source code is available below and should compile out of the box for MsWindows (Visual C++ 2003) and MacOSX (GCC 4.0). It should be fairly trivial to adapt it to Linux. As do every open source project, iFindSpace can use contributions. The most wanted ones are Linux compilation and packaging, and translations to languages other than French and English. You can send any comment, bug report, suggestion to Eric Nicolas. Paypal donations to this email address are also very much welcome if you like the product.